Daniel Clowes is considered one of the most notable comic artists of our era and has had a couple of his works made into feature length films. An example of this would be his book “Ghost World,” about two girls and their journey after replying to a man’s newspaper ad for a date, which was turned into a film starring Scarlett Johansson and Thora Birch. He tends to feature lonely, self-loathing men who want to feel connected, but push away those that try to get close; the male ego is a constant in his works. In “Ghost World,” the man from the newspaper ad exemplifies these traits. In “Patience,” Clowes has made subtle changes of this theme, while also still remaining true to his tendencies. Clowes overloads the reader with tons of information in the beginning of the novel. He is purposefully using this tactic to leave the readers confused; it can be difficult to follow what is happening during the first time reading through, so it helps to read a second or even third time to truly capture all of the little intricacies. When Jack goes back to 2012, the readers will also learn more about why things played out the way that they did. In the scene after the one shown above, Patience starts to talk about her old life, but Jack doesn’t want to talk about it and quickly diverts the subject back to the baby. Everything seems to go well afterwards, but if you’ve read any of Clowes’ other books, you know not to be fooled by this. One day, Jack comes home to find Patience has been murdered. Clowes takes on the cliche of a woman dying early on in a story to provide momentum for the rest of the story, also known as being “fridged.” There are other occasions in his works where he has used cliches to call attention to them and even parody them to reflect the current state of our culture. While they can at times be subtle jabs at the cliches, Clowes makes his purpose clear by overly drawing on the use of the cliche of Patience being “fridged” and makes it over-the-top. He does this with his use of dramatic language, especially when Jack finds Patience’s body, and his colorful palette. After being framed for the murder of his wife and unborn child, Jack was sent to prison for 18 months. He was released after evidence appeared that proved him innocent, further giving him fuel for his quest for revenge. It’s suddenly 2029, and Clowes paints a picture of what he envisions the future to be like: inappropriately sexual public displays, monitors projecting a dictator’s speeches on loop, and people dressed in crazy outfits. A lot of this can be considered stereotypical of what people visualize when they think of the future. Clowes has been know to have depicted the future in a similar fashion in previous works of his. The line becomes more and more blurred as Jack keeps leaping through time, being yanked about time and space by the time-traveling device. Jack experiences these strange visions, and his body begins breaking down and reforming. Throughout the graphic novel, Clowes includes these wild, colorful images, and during the evolution of Jack reforming, he really takes advantage of that. He uses a much broader color palette in “Patience” as compared to some of his other works, such as “Ghost World” with its black, white, and green palette and other of his works that have stuck with the more basic black and white template. The vivid colors are very impactful in the scene where Jack’s body is being ravaged by the process of time-travel, his interior organs becoming visible through his exterior flesh. 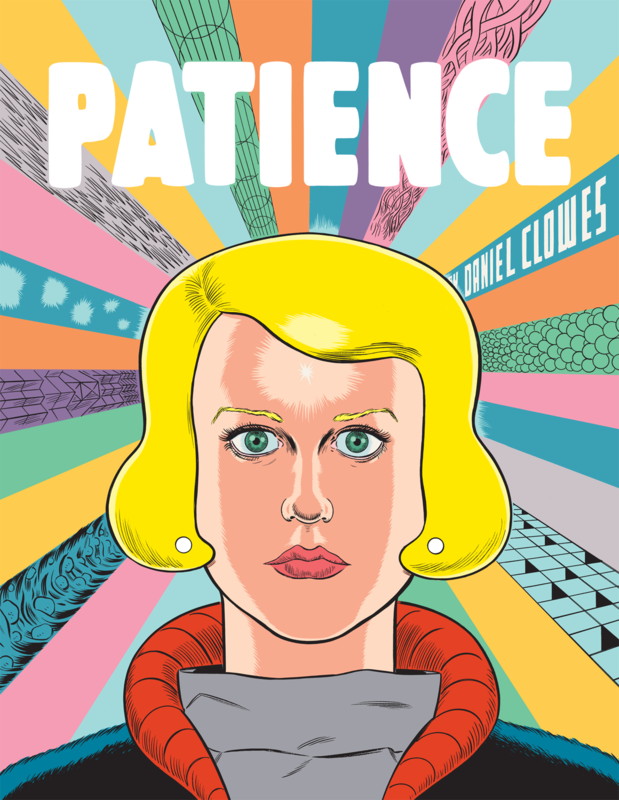 While “Patience” has a similar thematic style to Daniel Clowes’ other works, there are some interesting differences. His male protagonist, while still a loner with self-deprecating tendencies, goes to great lengths to exact vengeance for his wife’s murder. Fans of his oeuvre may be conflicted about their feelings for this piece. There are several cliches that occur throughout the novel that can give readers pause, but by the end they should be able to see the way that he is using them in a parodic manner. His art style was amped up for this piece as well, so die-hard fans may have a hard time liking the immense color palette that Clowes uses. “Patience” is a story of love, murder, and self-discovery. Clowes paints a vivid picture of love lost and a man doing whatever it takes to find his wife’s killer while struggling with the morality of changing fate. The visuals are so beautifully executed that Clowes’ storytelling is amplified by their use. About the Author: Daniel Clowes was born in Chicago, Illinois, and completed his BFA at the Pratt Institute in New York. He started publishing professionally in 1985, when he debuted his first comic-book series “Lloyd Llewellyn.” He has been the recipient of multiple awards for his seminal comic-book series, “Eightball.” Since the completion of “Eightball” in 2004, Clowes’ comics, graphic novel, and anthologies have been the subject of various international exhibitions. Clowes currently lives in Oakland, California with his wife and son, and their beagle. About the Author of this Post: Kayla Etherton is a recent graduate of North Central College majoring in Graphic Design with a minor in Marketing. She enjoys reading all kinds of sci-fi/fantasy literature, but has recently been reading mostly graphic novels. She is also an alum of the NCC Women’s Track and Field Team. Happy Monday! We know it’s cold and snowy, but this can also inspire you. Write a short story about an unexpected snowy day and post it in the comments. Happy writing! 30 N. is proud to be hosting an interview with Lucy Tan for her novel “What We Were Promised.” Be on the lookout with our social media and website at 30northliterarymagazine.com for more details.